The Sixth Doctor, Constance and Flip are visiting Bath in 1956, hoping to visit the famous baths and try to take a trip around what was essentially a giant playground for the rich and nobility. Certainly the last thing they expected was to get caught up in the slave-trade triangle, a heavy topic that Doctor Who has normally never touched. Briefly mentioned in The Highlanders and Remembrance of the Daleks, the slave-trade Triangle is a dark and disturbing part of British History. With ships docking in Bristol, slaves were put onto new ships bound for America, while some stayed in Britain. It is a horrible fact that the British public at the time sat back and enjoyed the tobacco and sugar that was harvested under terrible conditions. In The Behemoth, it is just as disturbing that the Doctor can’t do anything about it. All too often we have seen him take down evils that would bring apocalypses to a dozen worlds, but a situation where people are traded away for pots and pans isn’t something that can be stopped at the flip of a switch. This is the harsh reality of history that the TARDIS crew suddenly realise they have to deal with and it is this that gives us a story with a dark tone that we haven’t heard since 2016s, The Peterloo Massacre. For the TARDIS crew, The Behemoth takes place after Quicksilver, a story where Constance found out the fate or her straying husband and Flip is whisked away moments after her own wedding. Coming from Bletchley Park in 1944, Constance is someone who believes in the stiff-upper lip, someone who doesn’t take any nonsense and can handle herself. Following her first proper story in Criss-Cross, Constance quickly became one of my favourite Big Finish companions and her appearance here proves she is just as brilliant. On the other hand, Flip was always a different beast for me. This is not a reflection on Lisa Greenwood’s performance but Flip had always come across a little generic for me, not the type of character I had come to expect from someone like Big Finish. Thankfully, she is brilliant here and a lot of that comes from the dynamic between her and Constance. Constance coming from a period in history and Flip being a modern girl should mean that the pair don’t mix well. Thankfully Constance has enough humour and fun written into her character, even if she does her best to hide it, means the pair get on like a house on fire. Given that chronologically, the pair have not long met, they come across as old friends here. Maybe there could be more stories apart from the trilogy made up of The Behemoth, The Middle and Static, that we could be getting? Colin Baker has quickly become the star of Big Finish. Arguably, this Doctor is the one incarnation who has received the most welcome of character developments from the talented writers and it is interesting to the learn that The Behemoth was written at the request of Baker as he wanted a hard turn from science fiction and some old-school historical fun. The Sixth Doctor plays a role something akin to the First Doctor in this play, he is there but slightly on the side-lines, only getting involved when he absolutely has too. In fact, he seems more interested in getting involved with Mrs. Middlemint than he does any of the other action. The relationship between the pair is something that verges on romantic, so much so that there is a moment where Constance and Flip believe they are about walk in on the pair in a compromising position! Humour is something that author, Marc Platt brings brilliantly to the table with this story. With the use of a rhino, called Lady Clara, there are moments that seem to have been plucked right out of Del Boy Trotters’ brain. At one point I was expecting someone to shout, “There’s a rhino loose in the city!”. Perhaps that would have been a move that was a little too on the nose but Platt uses comedy for the entirety of the first episode before pulling the rug out from the under the listener from the second episode onwards. Constance befriends Reverend Phillip Naylor, a committed abolitionist and he opens our eyes to the fact that this so-called, polite society, was built on the backs of slaves. Surely there has never been a story that has flipped so quickly and it seems so natural. Perhaps that is because in society in those times, slavery was just as natural as throwing parties and going to balls in all your finery. And the secondary characters’ acceptance of things that makes it even more disturbing. The Behemoth also sports a brilliant cast, all of whom are firing on all cylinders. The main cast particularly shines in this dark material. 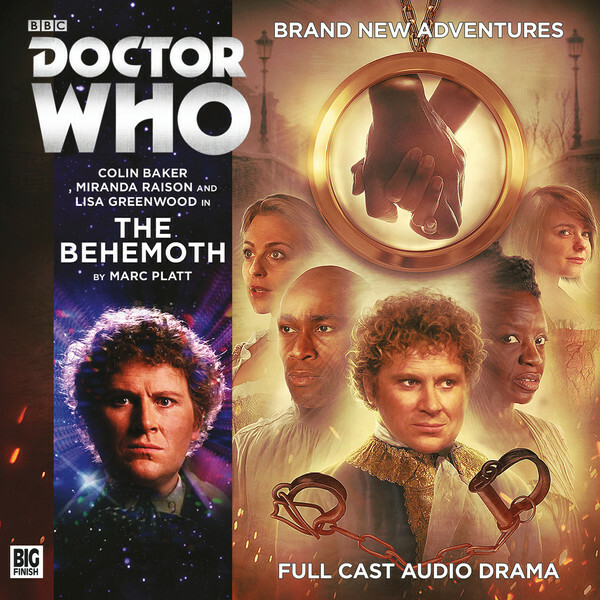 Colin Baker is brilliant as a more romantic begins to shine through his incarnation of the Doctor and Miranda Raisin as Constance Clarke really gets across her utter shock at the idea of slavery. Her speech about fighting fascism is outstanding and Lisa Greenwood takes joy in the sub-plot with Flip trying to avoid the attention of the persistent attention of the upper-class twit, Titus Craven. The material given to Flip and Titus reminded me of Barbara and Nero in The Romans. All the cast play their parts with nothing but utter and complete conviction. The main cast never forget that they are observers to history, they can never interfere. Well, not too much.